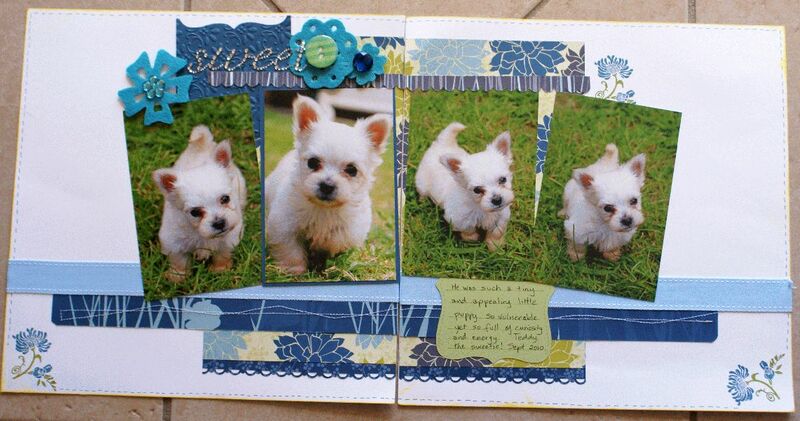 A double layout can make quite an impact in your scrapbook album. "Whoever said you can't buy happiness forgot little puppies"
Lately I have been drawn to scrapping two coordinated pages at once for my albums. I used to find it hard to do these and also a bit daunting, but now I love the extra space and freedom to develop an idea it allows. I have also noticed that scrapping this way helps my album to look much more coordinated. Making two pages on the one subject that link together makes quite a great impact for browsers of your album, I believe, especially when you have such cute pictures to work with in the first place. I made this set of pages for my Dog Scrapbook, of course, but imagine these pages with your favourite baby photos or with portraits of your family? In this case, I did use a sketch given to me at a scrapbook retreat I was attending. Unfortunately I do not know the name of the sketch maker, but my pages should give you a good idea of how it originally looked. I loved the idea that I could use four photos together like this and really only had to choose the one I wanted to be a little more prominent. I matted the main photo with a deeper blue cardstock (the second photo on the left). Then I needed to choose my designer series paper. I selected ones that had blues and greens in them to allow the white of the puppy and the background to pop. You can probably see that I used retired Stampin' Up! designer series papers and cardstocks and my Big Shot to emboss a piece of Marina Mist cardstock at the top left. I used the Vintage Wallpaper embossing folder for that one. HINT: To help you keep the pages matched up in the middle while you work on them, lightly adhere them together on the back before you start to scrap with a few pieces of removable Washi tape, or use removable glue dots and some scrap paper to keep them from separating then remove the glue dots and paper after you have completed your pages. This helps you get everything straight when you carry an element right across both pages. I used my Stampin' Write markers to colour up the Friends Never Fade stamp itself for the background so I could get different colours for the petals and leaves from one impression of the stamp. 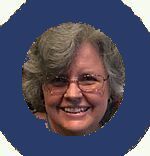 I stamped those images directly onto the white background cardstock after I placed my photos on the page and knew where i was going to place my border papers. The stitched ribbon was also in my retired stash of Stampin' Up! products. I actually used a sewing machine randomly along one strip at the bottom of the pages and my scallop edge and scallop trim border punches to make other strips more interesting. The felt flowers, buttons and bling were also in my stash, origin unknown! If you make a double layout that you would like to share, I would love to see it.